:: clevergirl.org ::: 201. The World Needs Another Mociun Tie-Front Dress Knockoff! 201. The World Needs Another Mociun Tie-Front Dress Knockoff! I am telling you! I had once upon a time thought about buying the actual Mociun dress (on sale). But I changed my mind last winter and decided to buy The Boots That Changed My Life instead, which I have not yet shared with you but oh, their time in the blog spotlight is coming. You'll never believe what pattern I used! The Citrus Dress pattern, McCalls 5879! 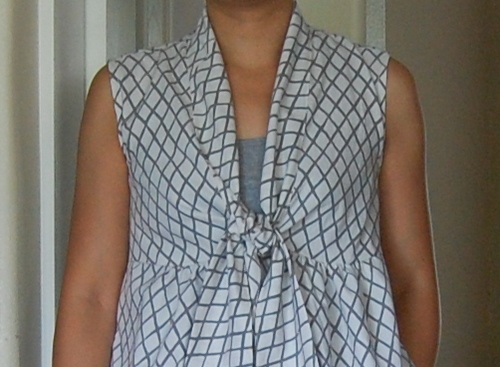 I blended the top (altered from the Citrus Dress to take one inch from the bust) pattern pieces with a shirt pattern to extend the shoulder in both directions, and simply changed the skirt pleats to gathers. My neck sash was 8" wide, and then folded in half and sewn to the neckline with 3/8" seam allowance. The sash extends approx. 12 inches from the dress on each side and is completely cut on the bias (two long pieces sewn together). I used a twin size bed sheet from the thrift store, knowing that I would probably not be able to cut the neck sash on the bias from any of the 2-yard cuts in my stash. I'm not sure the sash has to be cut on the bias, but for some reason it was a requirement in my mind. It was a 4-hour project: 1 hour to mess with the pattern, lay out, and cut fabric, and just under 3 hours to sew. I'm tempted to make another version someday, in a nicer fabric, but yesterday I needed the mental challenge and a short project to get my sewing mojo back. Not sure where it went... ??? It feels good to be back in the saddle, which is good because there are a lot of sewing projects in the queue. that is super-cute! it looks so nice and breezy for the texas summer, too! I really love this! I have set aside some vintage sheets for some cute dresses. I adore your version. I didn't cut on the bias but like the effect. My ties were so long! A sheet is a great idea. Enjoy it. I want to make another is a batik! I like your dress too, it's out of the ordinary. hey, great refashioning - the check looks super cute in this dress - better than the bed, I bet! Awesome! It's really cute and not at all like a nightgown! I would've never guessed that it was a bedsheet... what to go on the thrify! holy crap! it looks fantastic. you might feel like you are wearing a nightgown because you make it out of sheets, silly. It surely doesn't looks like one! I love how the geometric pattern on the fabric works with the shape of the dress. oooh really super cute! i can't wait to try this when i finally get to unpack my sewing machine! Wow, I wouldn't have guessed the citrus dress was the starting point for this one! I've never heard of this dress before--very neat design! This is a wonderful plaid womens dress and you can pull it off so well. I love how you matched the dress with the shoes. You really have a great sense of fashion. Haven't been keeping up with all my blog watching so missed this first time round. Great dress and very clever adaptation of the original pattern. Must look up Mociun - it is not a brand I've heard of. very very very very VERY very cute antoinette!! i just discovered elsie marley through you too! fun. i want to do the kids clothes week thing in september!! I like! 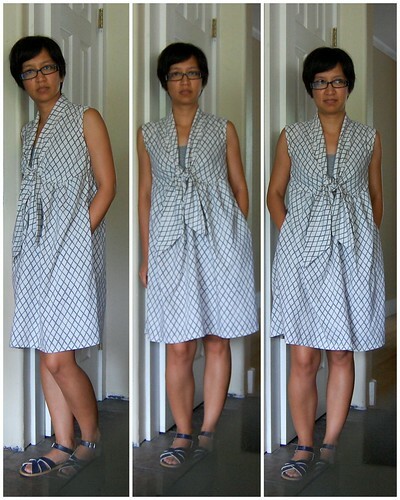 Another ingenius application of fabric + sewing pattern. Why is your left foot disappearing in the photos? Cute shoes, though.